Would you say the pain humans inflict upon each other and themselves is unnatural, or just part of evolution? For example, keeping animals in small cages, unable to move their whole lives, injected with antibiotics and then slaughtered for meat. Even in the "cruel" system of nature, their cruelty only lasts a moment, when they get their throat bit out or neck snapped by a predator. Humans often keep animals in cruel conditions for meat or medical experiments their whole lifetimes. Not to mention the medical experiments animals are subjected to, for example a rabbit, can last 5 to 8 years, or their whole life. 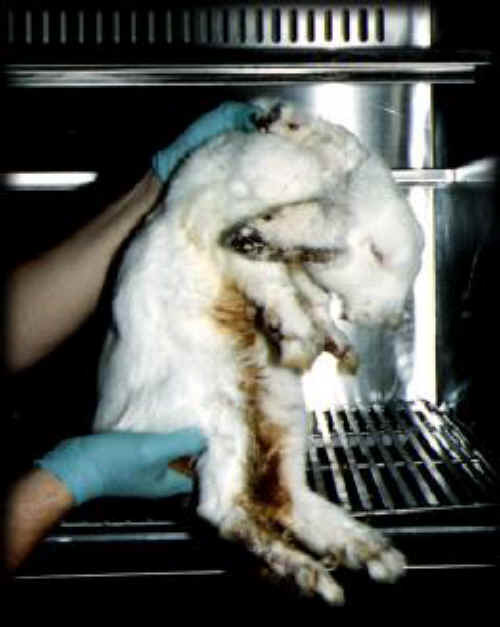 They often are injected with painful diseases, burned or otherwise used in seemingly sickening experiments. From observation, no beasts can match the cruelty of humans. Our civilized morals and compassionate intellect are what allow us to harm others in ways that we could not comprehend if we were in their positions. As a kid, I used to torture lizards and whatnot. Curiosity is a powerful thing. "Maybe we can learn something by injecting this rabbit with this chemical..."
"Maybe I can take my mind's focus off my insecurities by burning this rabbit in an oven.."
Ravus said:no beasts can match the cruelty of humans. This is a side-note: I was watching a Discovery Channel documnetary on large squids known to have attacked humans. The squid were voraciously feeding on krill and the divers commented that the squid were not aggressive (meaning towards humans). Earth was once seen as the center of the universe. That view was later seen as erroneous, yet we still view our own species as the "center" of the earth. When we go into space we will carry that view further. This may be a "hard-wired" survival mechanism or maybe just another sign of immaturity. To add another question to your mix, which is "better": to let bovines die out as a species or to keep them alive in less than "humane" conditions for our personal use? The answers you get will depend on whether or not the poster believes that non-human animals are here soley for our use and if they have a soul. In other words, are they qualitatively different or quantiatively different from us? Screw the bovines... what about pigs?! Should we genetically alter pigs to be like their longer-legged ancestors (long legs were bred out centuries ago)? Shhh! Don't let your girlfriend hear you say that. You will be cut off for a month. Humans are out of balance with earth......NOT!!! Let's define the word "natural"
733 topic views. 1 members, 2 guests and 4 web crawlers are browsing this forum.